The Cumbrian coast is a strange, other world, surprisingly industrial, yet miles from anywhere. Scotland to the North West, the beautiful lakeland fells to the south, but there ate surprises too: the wild tumbling sand dunes, and rolling tracts of gorse and heather immediately thrill the lover of golf links when he reaches that remotest Cumbrian outpost, Silloth. 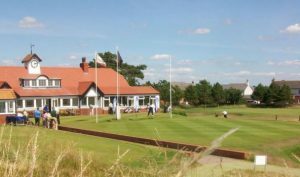 Silloth is noted for its excellent 18 hole natural links golf course, one of the most attractive and testing in the north. Laid out in 1892 and designed by Scottish professional golfer David Grant, the course has over the years benefited from contributions from other classic designers, Dr. Alister MacKenzie and Willie Park Junior. The famous Leitch sisters learnt to play here with Charlotte Cecilia Pitcairn Leitch (or Cecil) going on to become the best female golfer in the world. Silloth-on-Solway Golf Club’s reputation is becoming recognised more widely, thoroughly deserving its position in the Top 100 and one of England’s best links courses. The nine hole ‘Gnome-in-One Putting Green’ is on the Lawn Terrace side of Silloth Green and offers an informal type of recreation consistent with the character of the town. 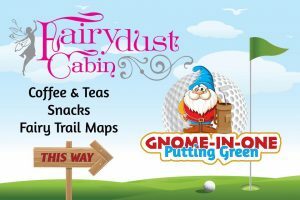 You can also pick up a map for the Fairy Trail, hire a deck chair and enjoy some refreshments at the Fairydust Cabin.